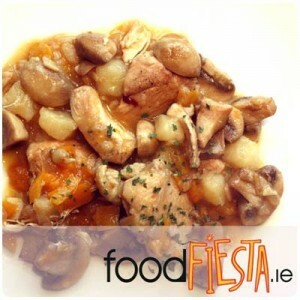 Our friends from FoodFiesta.ie, the Dublin-based catering company specialising in Spanish food and products, share another delicious recipe inspired by the Camino de Santiago. This week, why not try this chicken with garlic and mushrooms? Pollo al ajillo con champiñones. Season chicken pieces with salt and pepper and fry till golden in pan with extra virgin olive oil. Add peeled and sliced garlic and cook for another few minutes. Remove and set aside. In the same pan, sauté the halved mushrooms for about 2 minutes, remove and set aside. Then add the onion and peppers and cover pan on low heat, allowing the veg to poach. When onion has become translucent, uncover and add chilli. Incorporate flour and toss. Then add chicken and mushrooms, pour over white wine and water and add salt to taste. Cube the potatoes and fry in a small amount of olive oil. When soft and golden, drain and add to the saucepan. Mix well, sprinkle with freshly chopped parsley, cover and let sit for 5 minutes before serving.